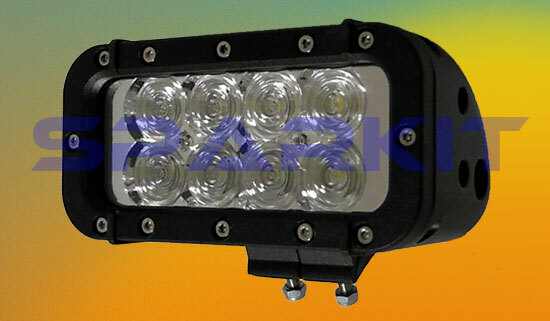 These are very rugged and solid lights suitable for heavy duty agricultural applications. They have rubber anti-vibration mounts and offer an excellent alternative to HID lighting in short to mid range flood lighting applications. Farm Bright LED lights are constructed of high durability aluminium alloy with polycarbonate lens. The lights are supplied fitted with a 1 meter cable terminated in a weather-proof two pin connector. Also supplied is a high quality work light style wiring harness including (12V) relay, fuse holder and switch. We carry a full range of spare parts and we offer a repair service should this ever be required. All our lights have a 12 month warranty. Height from mounting surface = 90mm. Beam = Flood, broad spot beam or mixed - 4 LED per beam type. Colour temperature = 6000K - Bright white. Operating voltage range = 12 to 30 Volts at full output power. Connection is by the supplied high quality wiring harness. Priced at $132 inc.GST each for a single light. We also offer discounts for bulk orders. Please contact us at sales@sparkit.com.au for prices.